We can't get enough of the humble candle - so much depth and intrigue in a little point of light. We praise their contribution to ceremony, mystery, magic, romance and formality - they're also pretty darned convenient when the power goes out, as well! Comb this enlightening category and never be in the dark again. 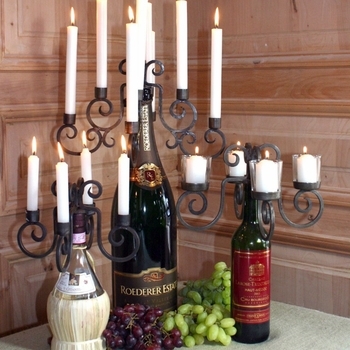 Perfect for any Tuscan table setting, decadent wine bar décor or classy outdoor dining design, our iron and metal candle holders, floor sconces, candelabras, centerpieces, lanterns and votives are a great way to light up any environment. These affordable essentials are great for weddings and special occasions as well as everyday home design. 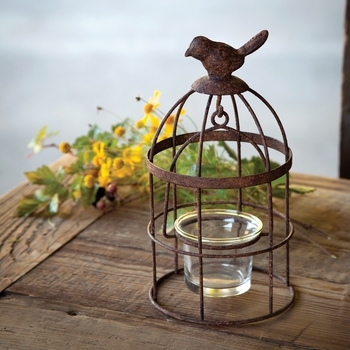 We have everything ranging from dramatic, wrought iron floor candle holders to rustic hurricane candle holders to help you light up the night in style. 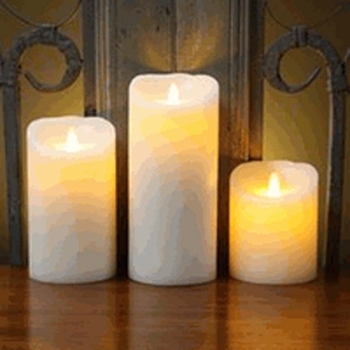 Candles are one of the smallest decorating accessories you can use to drastically alter the look and feel of a room. By placing candles throughout the house you can add warmth and a calming presence to any interior. Candlelight can add an aura of mystery, create a romantic setting, and set the stage for celebration. Candles serve a function as well as create a mood, quite an achievement for such a little thing! Placing candles throughout the house can help you to create everything from a subtle to dramatic glow. 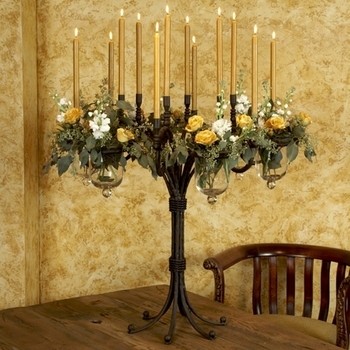 Wrought iron table sconces can help to create a romantic setting or set the stage for celebration. You'll also appreciate our enormous array of decadent wall sconces, including the perfect wall sconce for traditional, contemporary and transitional environments. Ornate and intricate iron wall sconces meet unique, beaded wall sconces in this selection. If you love the look of a sconce but hate the idea of a permanent fixture, decorate with gorgeous table sconces that house your favorite candles artfully. Iron Accents selects home décor pieces from artists, blacksmiths and manufacturers from around the world to provide you with an unrivaled selection of specialty home décor. 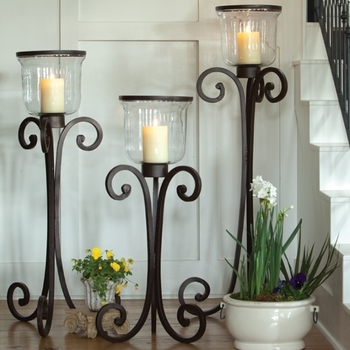 Complete your decorating theme with the beauty of iron accents and the warmth of candlelight. Light up the night, or just cast a soft glow for your gathering with our beautiful, unique candle trees. Create the perfect ambiance for any occasion. Whether you are dressing up your holiday table, serving a romantic dinner for two or decorating for a party centerpieces help to set the mood. 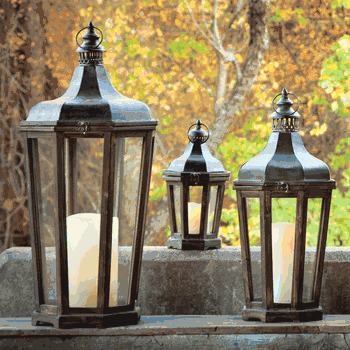 Wrought iron floor sconces are ideal for lighting entryways, beautifying garden decks and adding the inviting glow of a candle light to your homes décor. Creating a mood as well as illumination is the primary purpose of lighting. 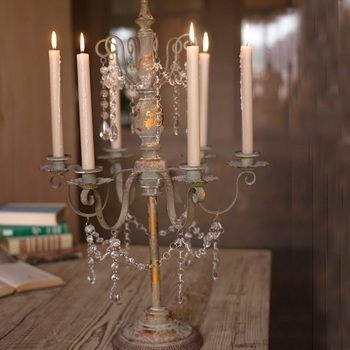 For a soft romantic look, nothing can beat the warm and inviting glow of a candle chandelier. Combining design elements that harken back to a bygone era, our series of architectural lanterns captures the timeless beauty of old world Europe in a stunning display of light and illumination. 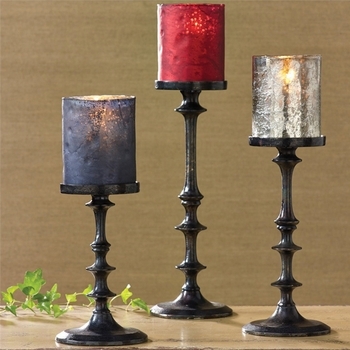 Decorate with mood-enhancing candlelight just about anywhere with votive holders. 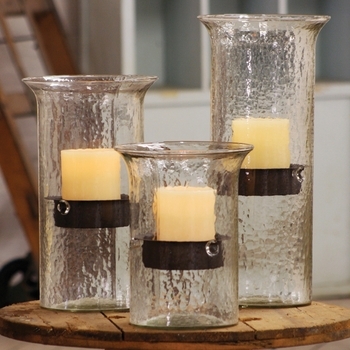 These glass holders are perfect for tea lights or votives. Loop ribbon or string through the handle and attach to ceiling hooks, tree branches and more. 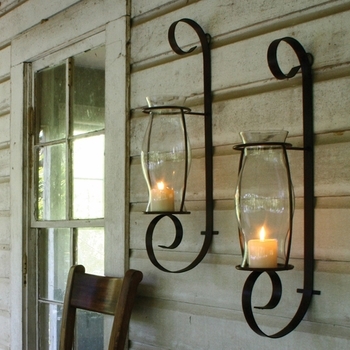 Create an elegant ambience with wrought iron wall sconces. Mounted alone or as a set of two or three, wall candle sconces will cast a soft glow, and create an atmosphere of intimacy and warmth.